Most lists of North America’s best trail riding destinations include Michigan’s Upper Peninsula (the UP). 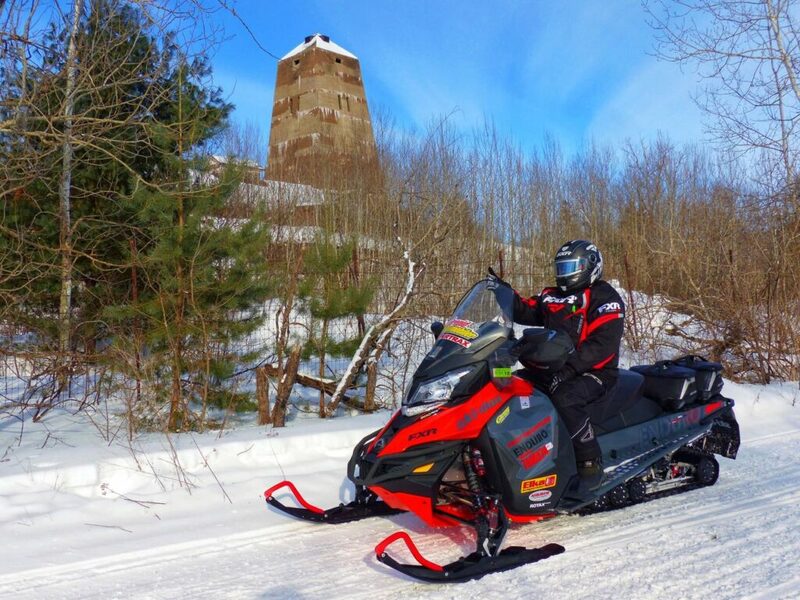 To provide this snowmobile Michigan Upper Peninsula tour planner, our Supertrax crew trailered there last winter. But figuring out where to go for our three days of riding wasn’t that easy. Why? Because the UP is made up of many popular snowmobiling areas. 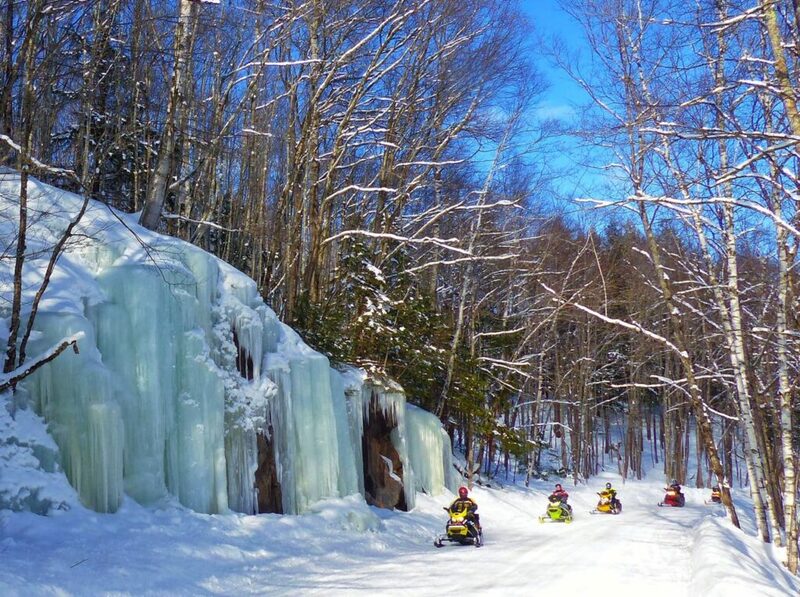 No wonder local residents, colloquially known as “Yoopers” are such happy sledders! The UP stretches from Drummond Island in the east for 320 miles west to Ironwood at the Wisconsin boundary. 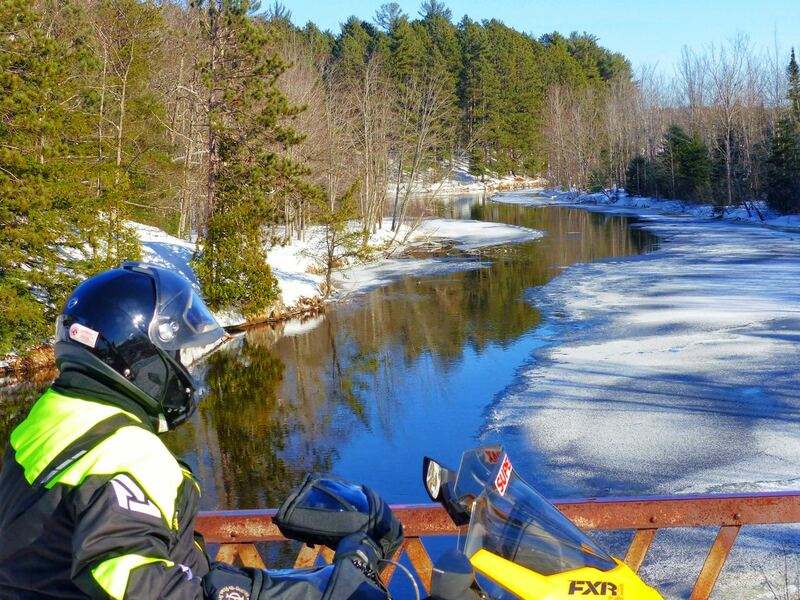 Within this area, snowmobile Michigan Upper Peninsula is a jigsaw puzzle of 15 counties. Each promotes its own sledding opportunities and has its own trail map. To my knowledge, there is no single trail map for the entire UP. This would includes all counties and gives an overview of where everything is. Plus display how the trails interconnect and the approximate distances from place to place. But no such luck. The main reason that the UP is a favourite riding destination is reliable, long-lasting snow. As any map atlas shows, the UP is almost surrounded by Great Lakes – Superior, Michigan and Huron. The prevailing winter weather patterns move primarily from west to east. So the result is lots of lake effect snow for the UP, with the more westerly counties often getting the brunt of it. And given that our busy tour schedule allowed only one shot at this ride, it made sense for us to stage more to the west of the UP than the east. But terrain also plays a major role in good trail riding. So we checked out the geography and discovered that one of the primary features of the Western UP is the Superior Uplands. This topography results in steeper, more rugged terrain. It culminates in the highest point in the state just east of L’Anse. Here, the 1,979 ft. Mount Arvon is in the heart of the Huron Mountains. In our trail riding experience, higher is always better for snow. 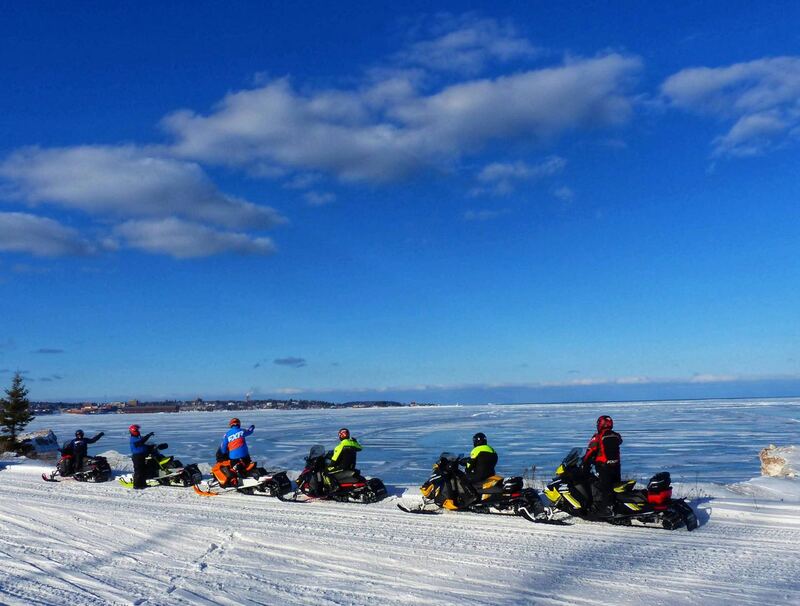 So score another reason to head more west to snowmobile Michigan Upper Peninsula. For our early February midweek visit, we wanted to do day rides staging from the same location. This is what many weekend riders would do. So that meant finding a destination where we could ride three different loops with minimal trail repetition from day to day. Since we were already driving a fair distance to get to the UP in the first place, we also wanted to limit our UP trailering time as much as possible. So we reviewed and compared various county trail maps. By doing so, we settled on staging from the central west UP town of Ishpeming. It’s located in Marquette County in the heart of the Marquette Iron Range. 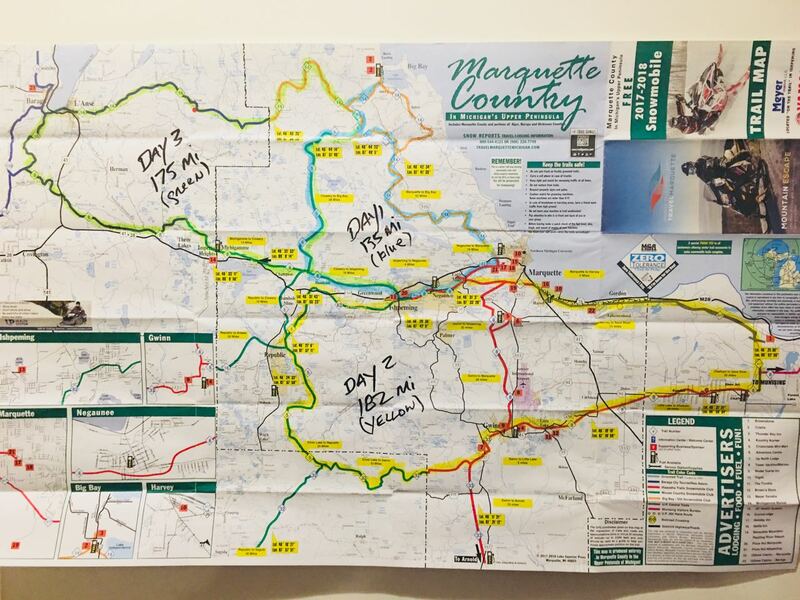 Next, we reviewed trail options and intersections on the Marquette County trail map. This helped we narrow our staging hotel choice to the Magnuson Country Inn & Suites. Although on-site truck & trailer parking was tight, this hotel is located near a gas station and restaurants. It also provides direct access to the two main east-west corridors, Trails 8 & 82. These run along part of the Iron Ore Heritage Trail, a rail-trail celebrating the region’s mining history. 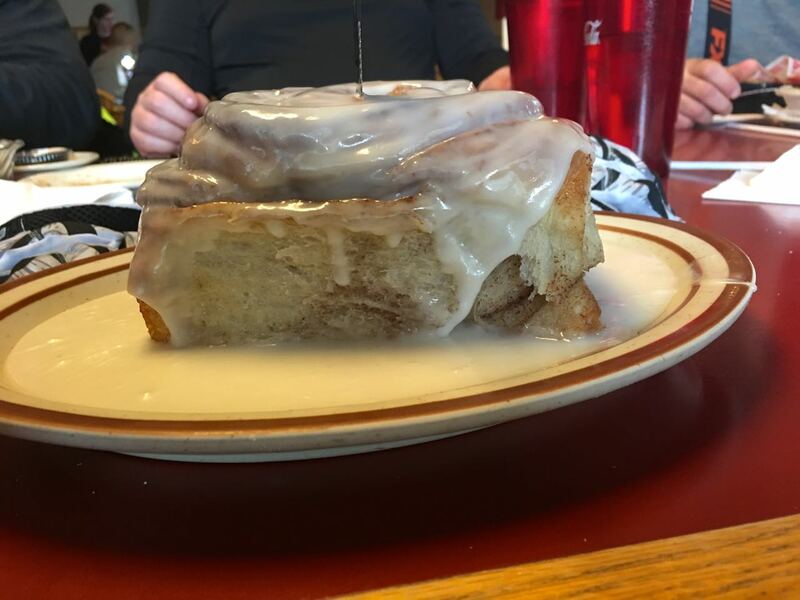 From the Magnuson, we rode one 135-mile northern loop to Big Bay for lunch. Then we explored a 182-mile southern loop through Gwinn and Chatham in Alger County. And finally, we snowmobiled a 175-mile northwestern loop into Baraga County for lunch in L’Anse. One advantage of these loops is that each returns to Ishpeming on Trails 8 or 82. Both of these provide easy, quick end of day riding for the weary homeward bound. So is the UP really one of North America’s best trail riding destinations? Yes is certainly the answer if the exceptional trail riding we experienced in Marquette County is any indication. Overall, the midweek trail traffic was light. This may not be the case on weekends, which we’ve heard can be very busy. The trails were a decent width and regularly groomed. They were also well signed, although the old style signage wasn’t as modern as other best destinations. The terrain was varied, interesting to see and enjoyable to ride. If we’d had the time, we could have done a good overnighter through neighbouring Baraga and Houghton Counties into the Keweenaw Peninsula. Along the way, we encountered many memorable sights. The aforementioned Mount Arvon on Trail 14 was one. The one-pound sweet rolls at the Hilltop Restaurant in L’Anse were equally impressive to see and absolutely scrumptious to eat. And don’t miss the amazing creations at the one of a kind Lakenenland Sculpture Park on Trail M417 just east of the town of Marquette. Admission is free and there’s even a snowmobile trail running through it. Farther west, Trail M417 runs beside Lake Superior with some remarkable views of shoreline ice formations. Plus there’s a great lookout over Marquette itself. On various trails, we also spotted ice cliffs, and towering trees in old growth forests. We also saw old mine sites and several other scenic lookouts. Our routes didn’t include any ice crossings. There’s no doubt that the UP caters to snowmobilers. Plenty of services are trail accessible and welcoming. 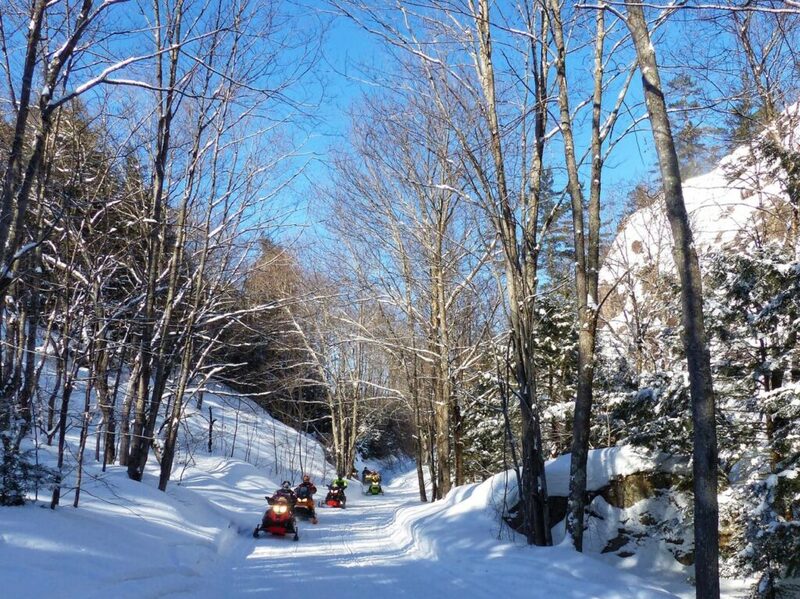 But of course, what really makes a top snowmobiling destination is abundant snow. That’s what attracts riders early. It also keeps them coming all winter. And makes them return at season’s end when many other locations have already lost theirs. 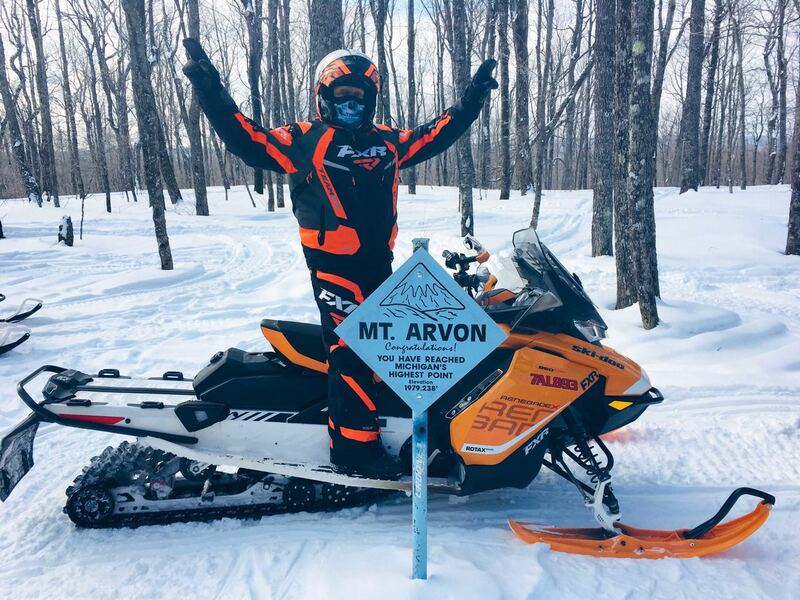 With so many choices of places to ride, it’s no wonder that many snowmobilers list the Upper Peninsula as their winter home away from home. Special thanks to local snowmobiling legend Don Britton for making our UP visit a Pure Michigan treat!